As some of you may already know, I just ran my first half marathon at the end of March. Now, I must tell you that I’ve loved running for years, but with that said, I’ve never taken the time to train myself for such a long run. How could I? I have two young children, a more than full-time job, a house that needs cleaning, a dog that needs to be walked, and oh yeah, a super cute husband that loves to spend time with me. Where on earth could I find the extra time to add a mini-marathon to my to do list? Well, I’ll tell you. First, running is something that I’m passionate about and that I love. That, of course, makes the training process a little easier and may I say fun. Second, I picked a race to run in one of the prettiest places I know, horse country in Lexington, KY, that will give you motivation. The advertising for the race talks all about the amazing scenery and bands playing along the route, how could I pass it up? Third, I signed up with a friend, this will be so much fun, I’m not backing out now. Last, but not least, I set a time goal for myself to cross the finish line. I know they say you shouldn’t do that on your first race, but come on people, I’m in development, I love meeting goals! I’m telling you this story because here at the Global Game Changers I feel like we’ve just run our very own, not so mini, marathon. Here’s how! First, you know that our entire team is passionate about helping kids find their own love for philanthropy. We want kids to know that giving back by using their talents and interests is fun. We want to create products that kids will love and parents will enjoy too, in comes the importance of making inspiring, quality and visually impressive products and packaging for our customers. This criteria is important for any brand! You know what I’m talking about. When you’re at the store and you find a package that just jumps off the shelf at you, saying read me, learn what I’m all about, I’m awesome, pick me, take me home. That’s our goal for our products. Third, we want to inspire kids everywhere to get involved in giving, to invite their friends to join them, and to make it a part of who they are not just something they do! So, now, after months and months of crossing off lots and lots of mini-goals on our checklists, we’re crossing the finish line today! And with that said, it is my honor to introduce you to the newest member of our product line, our Make Me A Superhero Activity Kit! This item has everything your little one needs to become a REAL-LIFE superhero TODAY. The kit includes: The Global Game Changers hardcover storybook, your choice between a red, blue, or hot pink satin polyester superhero “Ignite Good!” cape (This is not a cheap cape, my friends. This is high quality), our 52-page Superhero Activity Book with trading cards, finger puppets, games and more, Mission Up! 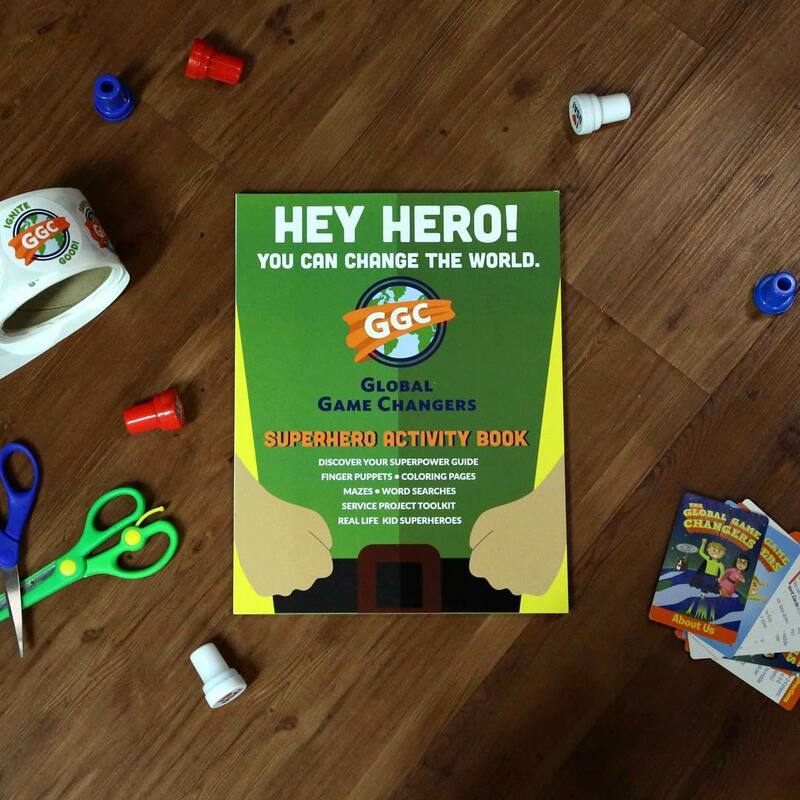 Card Game where kids have a chance to combine Talent Cards with Heart Cards to create the best Superpowers, plus a BONUS we’ve included a green GGC wristband and a Superhero Equation Worksheet that your superhero can use to determine his or her very own superpower. And just remember: every purchase supports our nonprofit and helps kids in school learn about our very special superheroes! I hope you will choose this gift for your favorite superhero! I can assure you that it’s one gift they will love! I look forward to hearing what you think about this new product and will keep you posted on my continued training efforts. Thank you again for joining us on our journey to many more finish lines victories!